Thursday, December 12, 2012, 5 to 8 p.m.
Special Discounts This Night Only, Fantastic Raffle Prizes! Join your fellow ladies of the lake for a fun night at your local gear hub and get psyched for winter along with the rest of us! Store-wide savings and special deals offer the perfect chance to do some holiday shopping, or to simply spoil yourself! 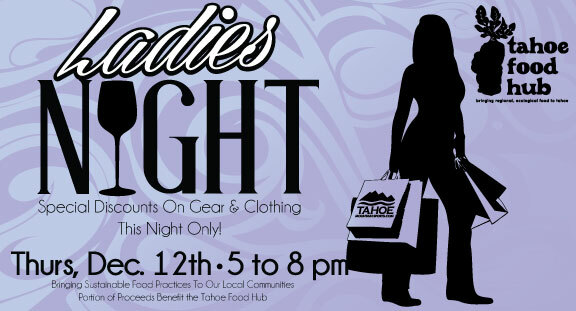 A portion of proceeds from Ladies Night will benefit the Tahoe Food Hub, a local non-profit that works hard to bring our communities nutritious foods grown on local, sustainable farms and connect our local restaurants with food producers for a healthier and happier future. Take advantage of special discounts on gear and clothing this night only! There are great prizes to be won, including UGG boots, backpacks from Boreas Gear, outfits from Horny Toad and Prana, and lots more. We’re also giving out free socks with purchase! With winter just around the corner, we have everything you need to stay warm outside. If you’re into hiking, yoga, Crossfit, rock climbing, skiing or snowboarding, snowshoeing or Nordic skiing, we’ve got the gear to get you out there! Thank you to the sponsors of the evening, Uncorked, Prana, Horny Toad, Pistil, Wigwam, Headsweats and Boreas Gear! Uncorked (Squaw, Tahoe City and Truckee) showcases a large selection of limited production wines from around the world, and is dedicated to bringing great wine and food to the North Lake Tahoe area. 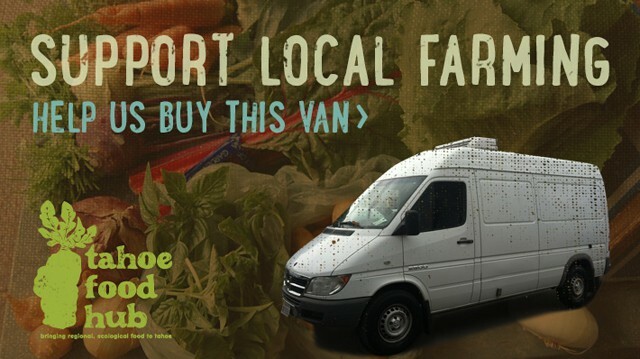 You’ll love the flavors they donate for this event!